Startling research shows that small towns from Maine to Missouri are in jeopardy from exporting their most precious resource: young people. 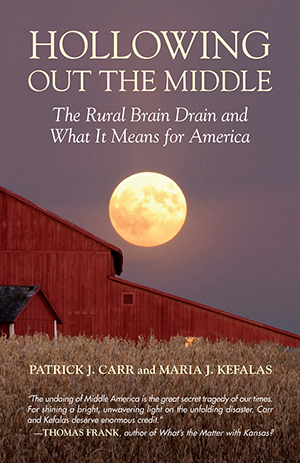 In 2001, with funding from the MacArthur Foundation, sociologists Patrick J. Carr and Maria J. Kefalas moved to Iowa to understand the rural brain drain and the exodus of young people from America’s countryside. Articles and books notably Richard Florida’s The Rise of the Creative Class celebrate the migration of highly productive and creative workers to key cities. But what happens to the towns that they desert, and to the people who are left behind? To answer that question, Carr and Kefalas moved to “Ellis,” a small town of two thousand. Ellis is typical of many places struggling to survive, and Iowa is typical of many states in the Heartland, aging rapidly. One reason is that many small towns simply aren’t regenerating, but another is that its educated young people are leaving in droves. In Ellis, Carr and Kefalas met the working-class “stayers,” trying to survive in the region’s dying agro-industrial economy; the high-achieving and college-bound “achievers,” who often leave for good; the “seekers” who head off to war to see what the world beyond offers; and the “returners,” who eventually circle back to their hometowns. What surprised Carr and Kefalas most, was that adults in the community were playing a pivotal part in the town’s decline by pushing the best and brightest young people to leave, and by underinvesting in those who choose to stay-even though these young people are their best chance for a future. The emptying out of small towns is a national concern, but there are strategies for arresting the process and creating sustainable, thriving communities. Hollowing Out the Middle is a wake-up call we cannot afford to ignore-not only because sixty million Americans still live in rural communities and small towns, but because our nation’s economic health and future is tied to the Heartland. An interesting discussion of the fate of small town America and what could truly be the cause, Hollowing Out the Middle is a fascinating and highly recommended read. "With a massive 'youth exodus' from heartland America, small towns face extinction . . . Deft and detailed case studies bring the population to life. . . . [and] the authors alert readers to this major change with clarity and compassion."